This voucher is valid on any order before 1 November 2018 (multiple orders allowed). NOTE: List prices are normally in Australian dollars and include Australian GST (tax). You can change the currency to give approximate amounts in several other currencies. Change the flag in the yellow bar at the top of the website - before you go to checkout. For sales outside Australia GST will be deducted when you enter your address in the checkout. Click on cruise link to learn more. This voucher is valid on any one Gen-ebooks.com order before 1 November 2018 (multiple orders allowed). NOTE: List prices are in Australian dollars and include Australian GST (tax). For sales outside Australia GST will be deducted when you enter your address in the checkout. 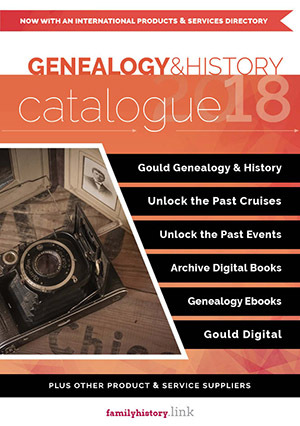 CLICK HERE to download a PDF copy of our 48 page catalogue of products and services from Gould Genealogy, Unlock the Past, Genealogy ebooks and sister brands. It now also includes products and services from some of our international partners.